Thank you for choosing Fagadau, Hawk and Swanson for your complete eye care! A crucial component of any ophthalmology practice is the business office staff. 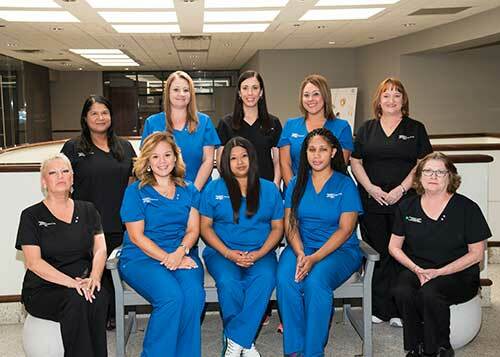 They perform such critical functions as greeting patients, scheduling appointments, verifying your insurance coverage, maintaining patient charts and records and making your experience with our practice as pleasant as possible. It is our desire that your visit with us be as pleasant and informative as possible. We know that you have many choices for eye care and appreciate your choosing us. Plan on being with us for at least an hour and a half to two hours for a comprehensive exam. Although our reception area may appear to be crowded, be assured that patients are treated according to scheduled appointments unless someone requires emergency care. In addition we have several doctors and other staff serving patients which means patients that may have arrived after you may be called back before you for another doctor or provider. Read, complete and sign in advance of your appointment the Registration, Financial Policy, Patient Privacy, Eye Questionnaire and Health History forms. For your convenience, you can download these forms. Please bring your insurance cards with you to your appointment. It is our goal to verify your insurance coverage prior to your appointment so that you will be prepared for any out of pocket expense at time of service such as co pays, deductibles and non-covered services. (Refer to our Financial Policy for more details). If you wear contact lenses or glasses, please bring them with you to your appointment. Arrive to your appointment on time. Being late for your eye exam affects not only you, but all the patients scheduled after your appointment. Working together will help us give you the best possible eye care. Thank you for choosing us as your eye care provider.